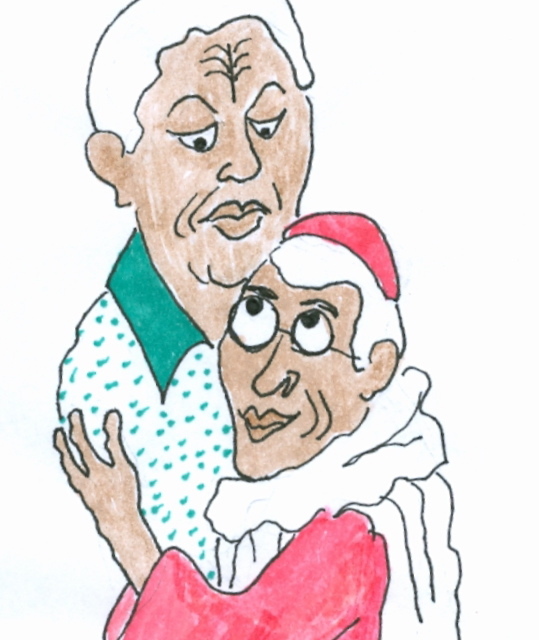 Bishop Tutu hugging Nelson Mandela. By E. Wagele. Desmond Tutu (born 1931) is a human rights activist who has campaigned for such causes as ending AIDS, tuberculosis, homophobia, poverty, and racism. Enneagram Helper types are interested in solving problems of their fellow humans. For this reason, Enneagram teachers often use Tutu as an example of this type, for example in the chapter on Helpers in The Career Within You. Bishop Tutu was named a member of the United Nations advisory panel on genocide prevention in 2006. He has likened Israel’s treatment of Palestinians to the treatment of black South Africans under apartheid. Some of his other causes include climate change, poverty, and women’s rights. Bishop Tutu rose to worldwide fame as an opponent of apartheid and was awarded the Nobel Peace Prize in 1984, the Gandhi Peace Prize in 2005, and the Presidential Medal of Freedom in 2009, among other honors. He chaired the Truth and Reconciliation Commission and still uses his high profile to campaign for the oppressed, even though he claims to be retired. For more famous Enneagram types, see my web site and my blog on Psychology Today. On Tuesday 1-3-12 I’ll write about economist Jeffrey Sachs on my Psychology Today blog.